After we had breakfast at the Red Lion, we took a taxi to the train station. The train to Bath just had two cars. We had reservations at the Pratt's Hotel, which was only two blocks from the train station, so we walked to our hotel. 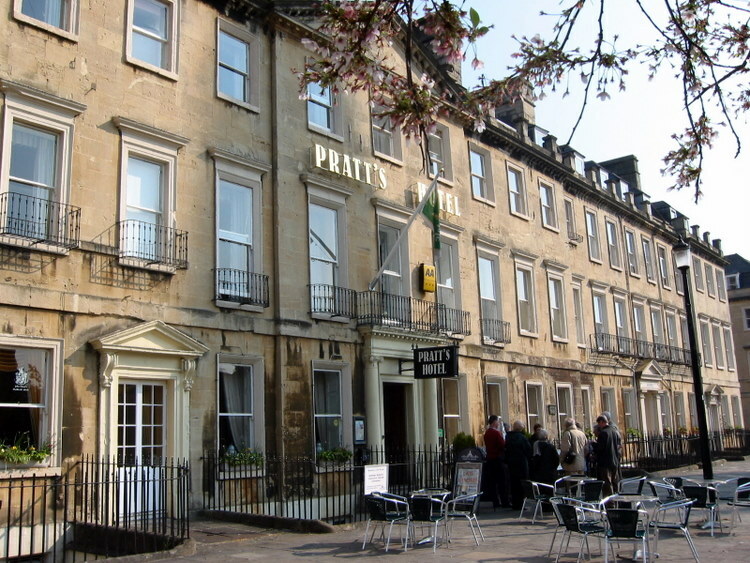 Pratt's Hotel has been part of the city’s heritage for more than two centuries. Built from the famous Bath honey-colored stone by one the city’s most famous architects in 1743, the hotel was originally built as five town house. The building itself has many interesting features, including the bowed landing on the staircase designed to enable the “chairmen” to take their clients back to their rooms following their treatments in the famous Spa Baths. Upon arrival, we registered in the hotel, took our luggage to our room and immediately walked to the bus station which was near the train station. 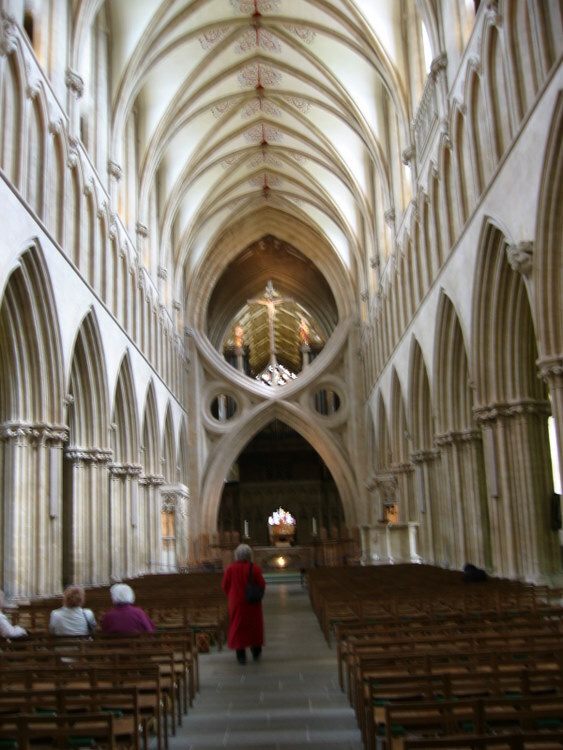 Our destination was the Wells cathedral. Bus 173 left at 11:05 for Wells. It was only 22 miles to Wells, but the bus trip took over an hour and a half. It stopped at every cross road to pick up local folks. Ladies got on with baby strollers. Other people boarded with their arms full of groceries and even their dogs. It appeared to be the local social hour. We finally arrived in Wells and found it a lively, charming old town. We found the Cathedral easily, sitting back on vast green lawn inhabited by people of various ages taking advantage of the beautiful spring day. The façade of the cathedral is awesome. It is covered with hundreds of statues. Many of the lower ones have been defaced and others completely destroyed leaving an empty niche. Behind the cathedral are five springs, five holy well, which gave the city its name. There have been shrines in Wells for two thousand years. In 705 the King of Wessex gave land to the Bishop of Sherborne to build a church. In 909 it became a cathedral. After William the Conqueror, John of Tours moved the bishop’s throne to Bath in 1088. 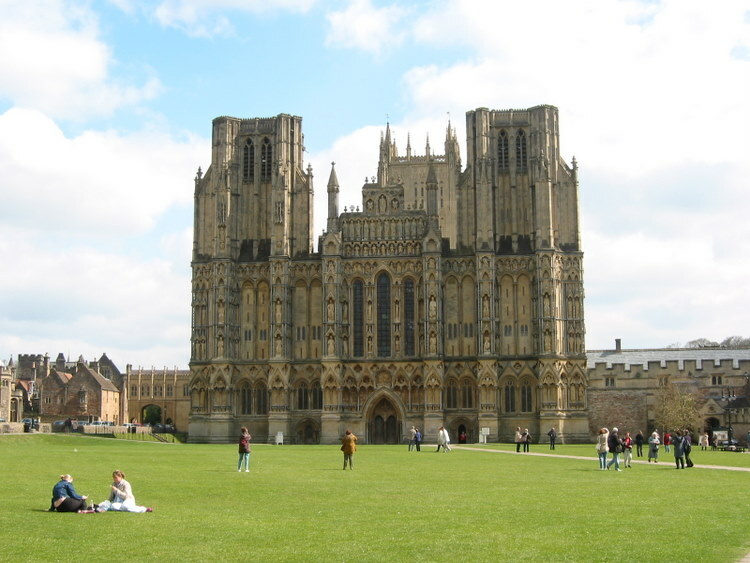 A hundred years later, 1180, Bishop Reginald moved it back to Wells and a new cathedral was started. 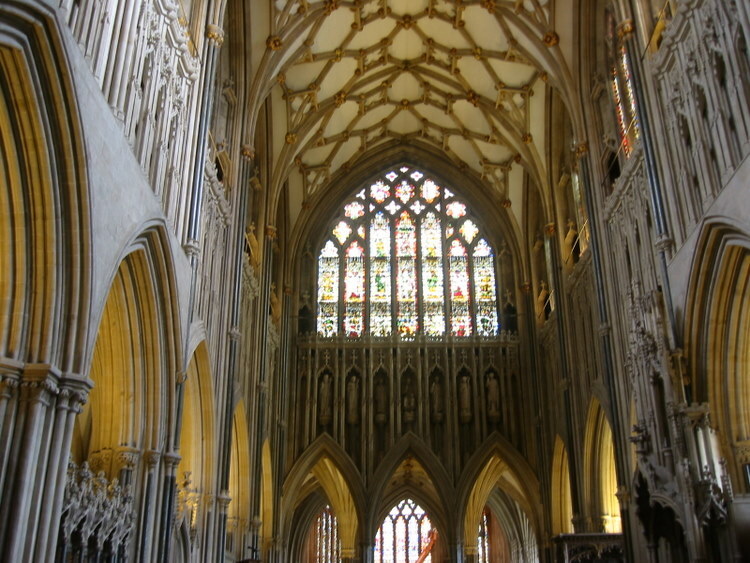 This church was the first church in England planned and completed in the Gothic style. Taking only sixty years to build, the church was completed in 1239. The central tower was completed in 1322, the southwest tower in 1394 and the northwest tower in 1436. We had not been able to secure a private tour prior to our leaving home, but they assured us that we would have a good tour. We had an hour before our tour, so we went into the lunch room. Like Salisbury Cathedral, the cathedral had taken a section of the cloister and made it into a cafeteria. There were long tables with benches. We both had a quiche and sat with some local folks. We found our guide, gave her a copy of the Washington Cathedral book, and began an outstanding tour. One of my fellow docents at the Washington Cathedral, Kathleen Smith, had been in Wells Cathedral the week before and our docent, Val Stevens, had given her a tour—small world. The first thing that one notices upon enter the church are the scissor arches. The arches at the great crossing under the central tower are crisscrossed to give added support to the tower that is above. These were added between 1338 and 1348 when the foundation began to sink. The tower itself began to lean and crack. The scissors arches were successful and the tower still remains stable. As in Westminster Abbey and Canterbury Cathedral, there is a quire screen or pulpitum on which the organ has stood since 1335. In the quire we experienced our first view of misericords. We will see misericords in other cathedrals. The misericords were used by the clerics to rest their “bottoms” during long periods of standing. These seats in the quire have a hinged bottom. The bottom or seat can be raised up to allow the clerics to rest on them – appearing to be standing - during long services. On the underside of the seat is an interesting carving, only visible when the seat is raised. We always looked for misericords in each cathedral we visited. 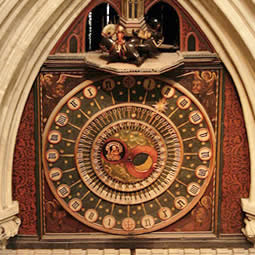 An interesting item in the cathedral’s north transept is a mechanical clock. It has been reminding worshippers of the time for over 600 years. It is a full 24 hour clock. There is an inner circle which tells the minutes plus another inner circle that indicates the number of days since the last full moon. The mechanical knights above the clock rotate every quarter hour. 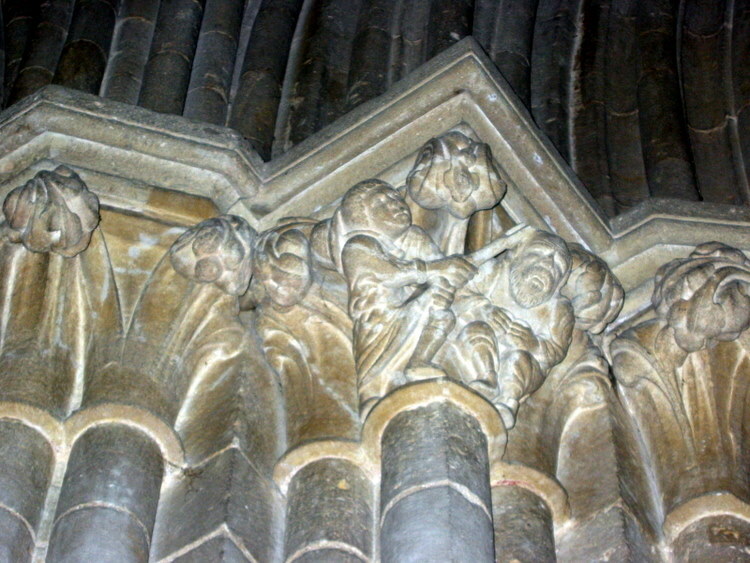 Jack Blandiver, a mysterious carved figure high up to the right, rings the bells. It is really unique. We will encounter a similar clock in Strasbourg and Beauvais. Another interesting feature is the carvings at the tops of the pillars- the capitals. They, in rather humorous characters, tell everyday stories from medieval life such as a man removing a thorn from his foot or another man with a tooth ache. Several columns have a continuous story all round the top, sort of like a comic strip. 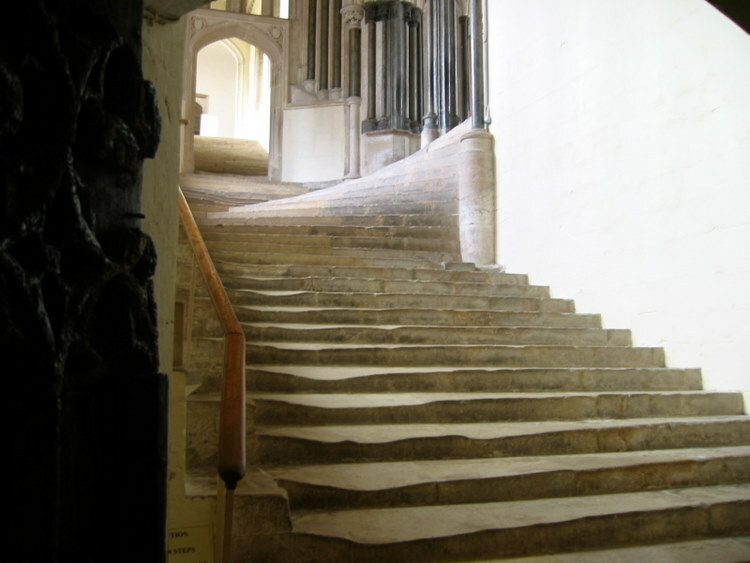 A photo published in many books about Wells cathedral shows the worn wall to wall stair case leading to the Chapter Room. The picture on the left is my photograph. The ceiling of the Chapter House, like that at Salisbury, was amazing with the center column fanning out to meet the fan arches of the side columns. 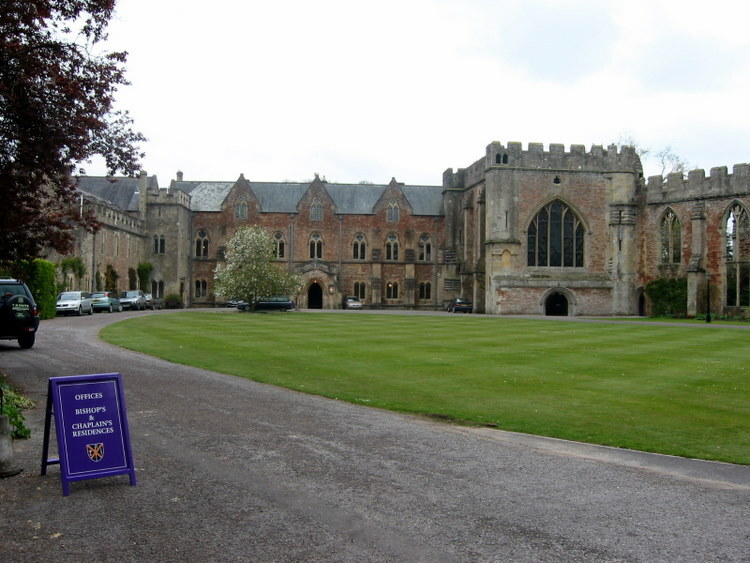 We went to the Bishop’s Palace and took a tour of it and the Bishop’s Chapel. Also on the grounds are the remains of the Great Hall . 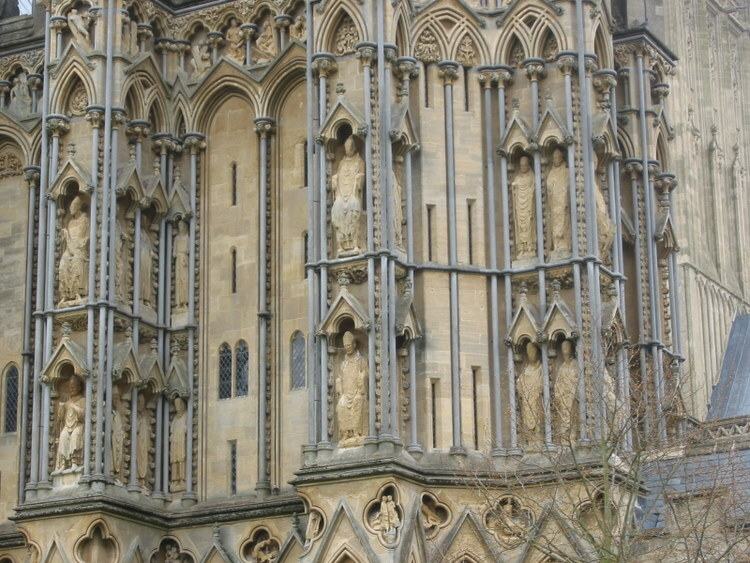 Our intention was to go from Wells to Glastonbury to visit the abbey but we didn’t have time. It was only six miles south of Wells, but the bus station attendant said we could take the next bus but there was not a return bus until the next day. We weren’t prepared to spend the night so we caught the bus back to Bath. It made as many and as interesting stops as on the way down. We got settled in our hotel room which was rather spacious. We went to the hotel dining room for dinner. It was lovely, well appointed room divided into sections. I had mushrooms for a starter and beef for the entrée. My wife had carrot soup and sole for dinner.